Complete an Interchange Modification Study (IMS) to improve safety and congestion. Consider a direct connection from I-71/75 to KY 842 to improve access for trucks between the interstate, US 42 and KY 842. Include a dedicated bicycle and pedestrian facility across the interchange. Reconstruct the interchange as recommended. Reconstruction of the I-71/75 interchange with US 42 will improve congestion and safety at the interchange. 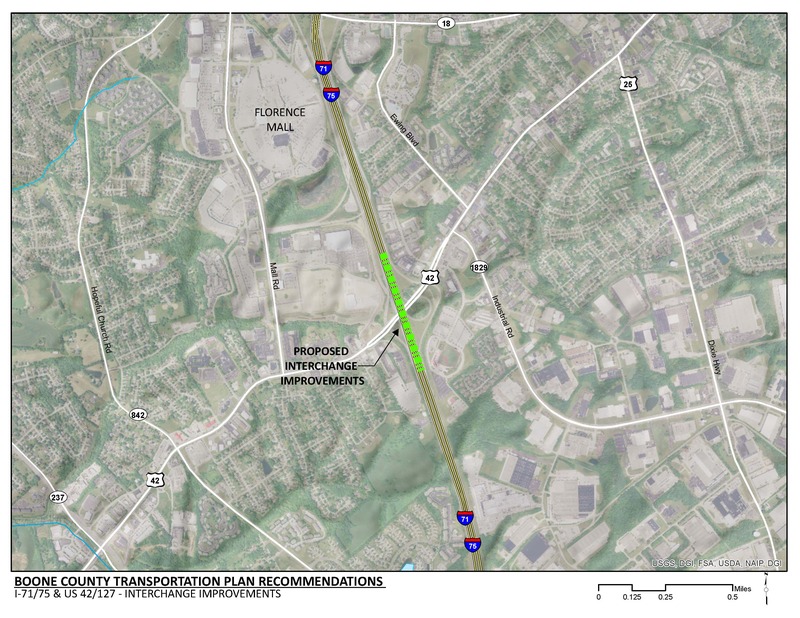 The project will improve traffic flow along US 42 between the interchange and Ewing Boulevard by consolidating access points and improving the distance between intersections. Capacity and safety at the northbound I-75 ramp terminal will be improved. This project will provide safe bicycle and pedestrian access on US 42. This project is consistent with Boone County’s overall goal of improved safety and connectivity for bicycles and pedestrians. Click HERE for a map of multi-use paths in Boone County. Businesses within the project area could be impacted by the project. The project will require additional right-of-way for implementation. A transmission line that runs through the project area may be impacted by this project. The I-71/75 interchange with US 42 is congested. Between the northbound I-71/75 ramp terminals and Ewing Boulevard, there are several closely spaced intersections. Of particular concern is the less than 300 feet of spacing between the northbound I-71/75 off ramp terminal and the signalized intersection of Dream Street/Freedom Way. Due to the short distance between intersections, the northbound I-71/75 off ramp terminal at US 42 is not signalized. The queue of traffic turning left from eastbound US 42 to Dream Street often blocks traffic turning left from of the northbound I-71/75 off ramp. As a short-term solution to increase capacity at the northbound I-71/75 off ramp terminal with US 42, an acceleration lane was installed on westbound US 42 for the traffic turning left off of the ramp. I-71/75 interchange with US 42 serves commercial development along US 42, Mall Road and Dream Street. Additionally, the Florence Freedom Center baseball park is located on Freedom Way just east of the interchange. The interchange also serves residential land use within Florence and central Boone County. The interchange is the primary access for industrial land uses along KY 1829 (Industrial Road) and along portions of US 25 (Dixie Highway). An additional 2,000 jobs are expected within the area by 2040. The crash rate along US 42 within the project area is 70 percent higher than the statewide along similar roadways. A fatality involving a single vehicle crashing with a fixed object occurred within the project area. TANK fixed route 1 and 28x utilize the interchange. There are several TANK stops located within the project area, along US 42 and KY 1829. There are no existing sidewalks on the US 42 bridge over I-71/75. A sidewalk gap also exists along US 42 between Lacresta Drive and Dream Street/Freedom Way.